The modern construction of the Berliner Verkehrsbetriebe (BVG) on Tempelhofer Ufer is adjacent to the Museum für Verkehr und Technik (Museum of Transportation and Technology) in the center of Berlin. The elevated track of U-Bahn (subway line) 2 passes between the two building complexes. This unusual situation is dramatized at night by a “gate of light“, into which the subway runs. 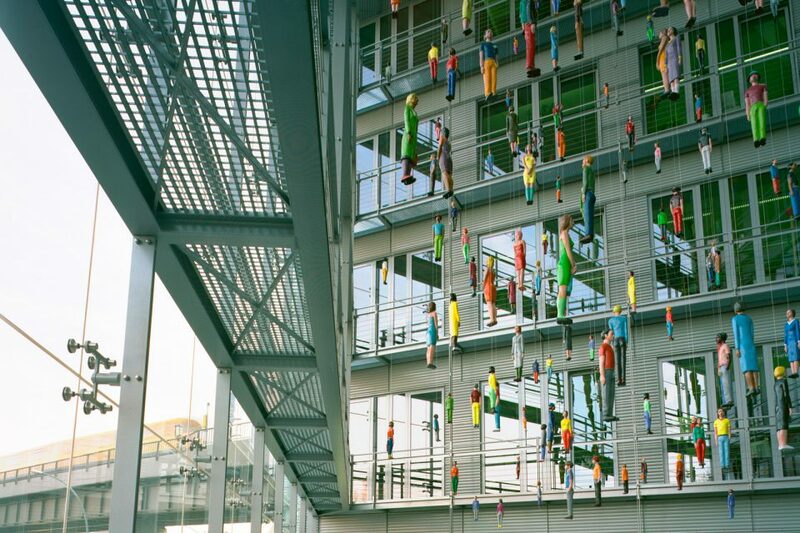 About 250 figures are suspended from the ceiling in the entire front part of the entranceway. 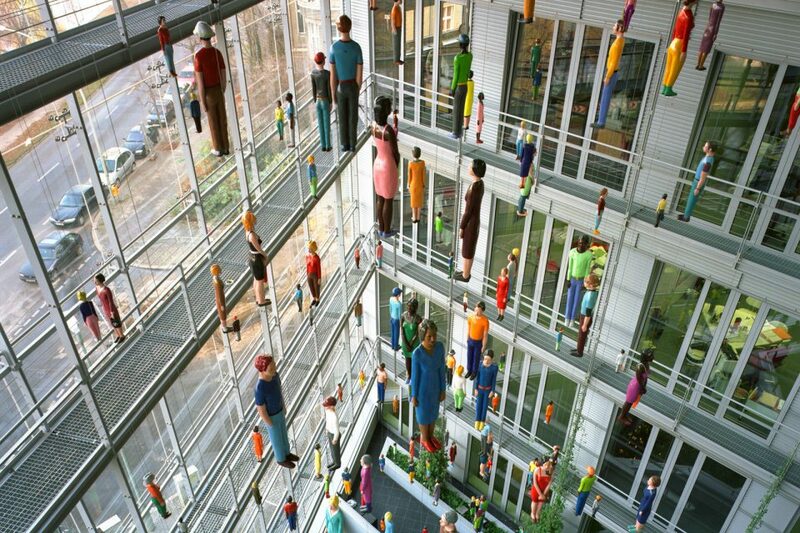 The figures, in three different sizes, are staggered in the space, intensifying the perspectival effect of depth. 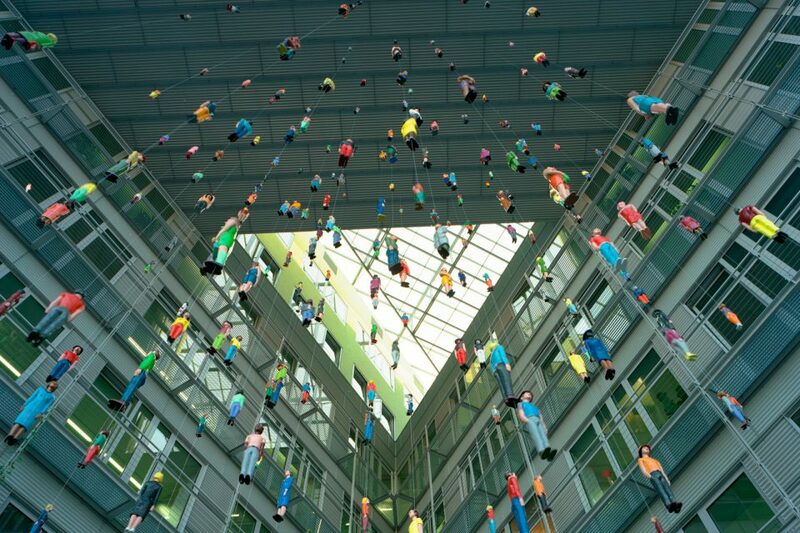 This creates the impression of a floating cloud of figures populating the entranceway in unvarying density. The figures differ in color, so that from a distance, a kind of abstract, pointillist image results. It contrasts in form and material with the austere architecture. In contrast to the nearby Museum of Transportation and Technology, the installation places people in the center. 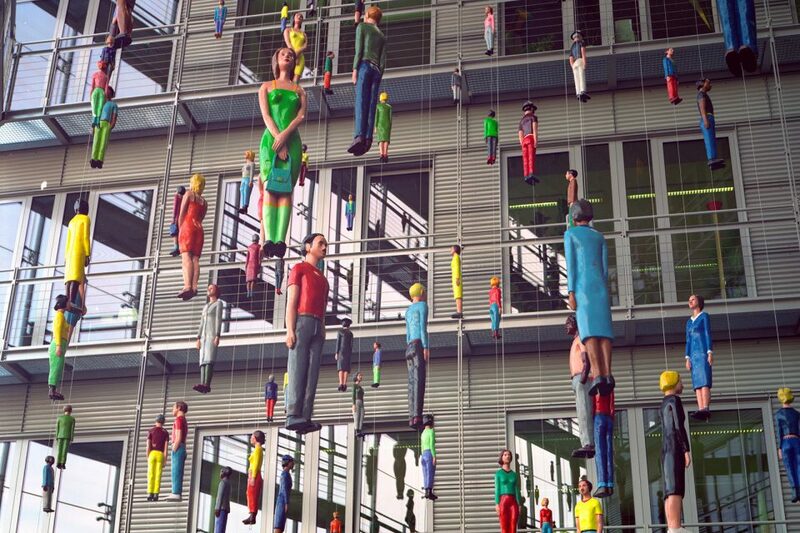 The emblematic image of the various passengers, visible from afar, consciously works with multiple parts that split up into different individuals when approached. The chosen image corresponds more to an atomized scent, an unconnected and weightless feeling, and thus conveys a stance toward transportation in strong contrast to the boastful gesture of the airplane suspended in the neighboring Museum of Transportation and Technology.